1. It’s too sunny, I can’t see in the glare. 2. I don’t ride counter clockwise. Actually Reason 4 is a fair point and he was truly brave on some of the horribly steep stretches – this is a tough climb. 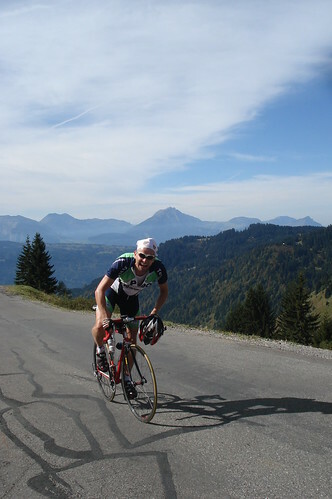 Day Two of Larry’s visit saw us attack the legendary Col de Joux Plane (this was the final climb in the 2006 Tour on Landis’ miracle comeback day. Armstrong was also cracked here in 2001 by Virenque). It is not the longest climb but it is very steep and irregular. Near the beginning and about half way are stretches with grade well in the teens. It’s rated Hors Categorie in the Tour due its steepness not its length – many longer or bigger ascent climbs are only categorie one. Martin joined us on a beautiful sunny day, and we were treated to a support car as my mom and Doreen played photographers. We had driven separately from the support car and the first two times they passed us we were standing taking photos and not riding, and then a girl passed us. We were not impressing our audience. Martin declared that anyone losing to the female rider buys lunch – so off we raced. Below, Larry bravely attempts to pass her. I have been up here three times, always in bad weather, so today was a pleasure. As we reached the top, Larry started screaming for photos to “prove” to his buddies at home that he had succeeded. 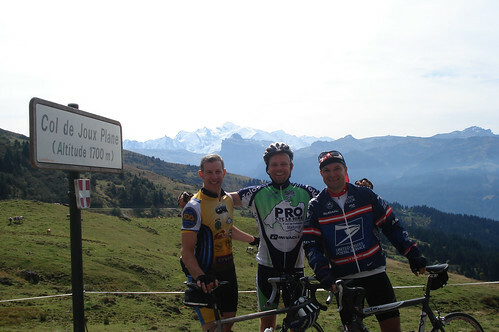 Below, Mont Blanc in background (the sign lies, Joux Plane is a few metres below 1700 metres). A quick descent down the easier east side past Col du Ranfolly (below) and into Morzine and we decided to have some lunch before continuing. 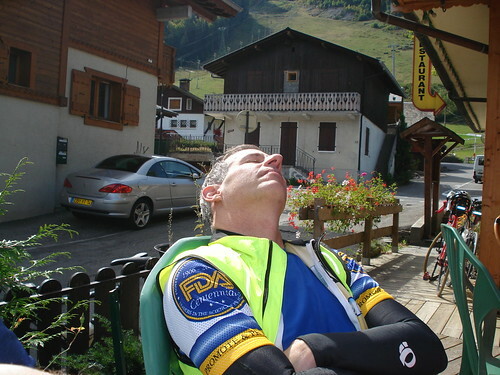 I just wanted a quick pizza but Larry shared years of cycling experience by illustrating the value of a quick power nap. After lunch was the Col de l’Encrenaz, a little known but stunning climb on a tiny road – but wow was it steep – this was my first time on the route and I was cursing my non-napping lunch – I am inexperienced. We passed up a right turn late in the ride to the Col de la Ramaz as we were approaching 2,000 metres ascent (although Martin found himself a little climb once we found the car to pass the threshhold). A truly fantastic day. We didn’t set any speed records but spent the drive home congratulating ourselves on such a great ride. Hey Will (and Larry). It looks like you guys are having too much fun. Steep climbs rock! I am so jealous. I hope you’re doing well. I’m working too much. I really hope I can get to Europe again next summer. Take care and ride hard. We have 1 spot left on my race team, are you interested? Great to hear from you. I would love to join your racing team – you’ve seen me ride – so I assume you are looking for a team bus driver or water bottle filler. As the weather gets cooler here I will bring the hybrid and mountain bikes out more often – not to mention the balaclava. Don’t work too hard and see you in Europe in 2008. Enjoyed the article. 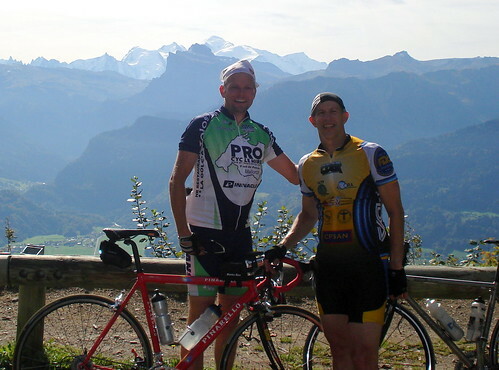 I’m not a roadie but had a crack at Col de Joux Plan with a mate on 30lb hardtail mountain bikes in July 2007. 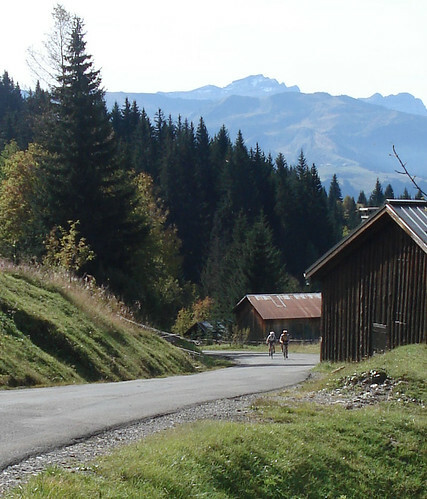 We cycled from Les Gets to Samoens then to the Joux Plan and then down to Morzine and back to Les Gets. I must admit I didn’t quite understand what I was getting myself into. Anyway I thouroughly enjoyed it and was chuffed to achieved the full route non-stop in 4hours. Okay not fast by road standards but not bad considering. I’d love to do it again…on light road bikes though! 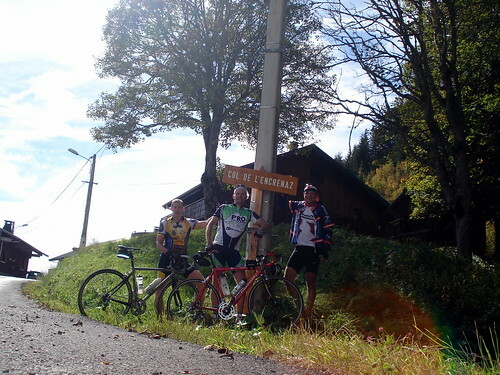 Well done guys, if you’re ever in Samoens again, we have an excellent Chalet In Samoens for you to lie down..
Just come across your website/blog after returning from Samoen and chewing bar tape up the Joux Plain in an early morning start to keep cool. I read with interest your climb up to Samoen 1600/Plateau des Saix. I only drove up this to watch the paragliding. Far too hot to ride up during the day but agree that it is probably more of a challenge than the Joux Plain in its steeper gradients. Has it ever featured as a summit finish in a pro race? Have you ever ridden up to the Cascade de Rouget? as this seems to be quite a good climb, albeit another ‘dead end’. Will be back in August 2014 and would be good to get in touch with view to perhaps riding out for a few hours. As best I know, Plateau de Saix has never been in a major race. But yeah, it is a great climb. You can ride to Cascade de Rouget, but I believe it is a steep Ski piste up, so a little hiking required. I believe there is an unpaved way up to Lac de Gers …. I bumped into a mountain biker once when we hiked up. But I haven’t ridden it yet. Thanks again Will for the site and all the great route options. Rode this one yesterday to celebrate being back on my bike again after broken collarbone. Fabulous ride, much of it properly steep as you say! 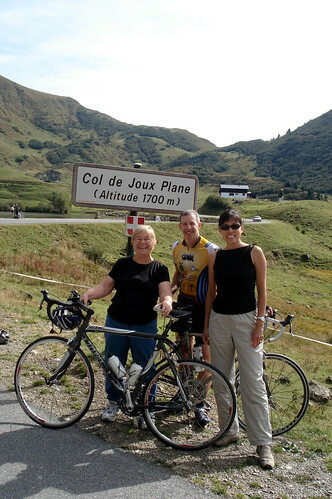 Joux Plane is a truly fantastic ride. 71 minutes a bit slower than Pantani’s 33!